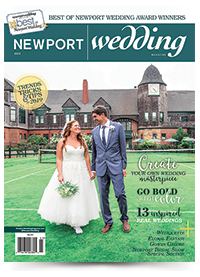 We look forward to meeting you at The 17th Annual Newport Bridal Show, Newport's biggest and best bridal event of the year and deemed “Well Worth the Drive” by Yankee Magazine! Hosted at two of the most elegant wedding venues, Rosecliff and OceanCliff, hundreds of engaged couples will be able to shop for everything they need to plan their perfect wedding all in one day! Browse our Wedding Professionals to preview the unique products and services showcased at our Newport Bridal Show. Be sure to purchase discounted tickets online by Friday, February 22nd, 2019 at 12:00 PM for a chance to win one of our fabulous door prizes! In addition, every bride- and groom-to-be will receive a Grand Prize entry form at the show for a chance to win two fabulous prizes: a wedding registry package at OceanCliff courtesy of Lenox, and a set of wedding bands at Rosecliff courtesy of Jason & Co., worth up to $5,000 each. Two $5,000 grand prizes, two chances to win a total of $10,000 in prizes! Your ticket allows you admission to both locations all day and free transportation between the two venues. Please Note: Baby carriages & strollers are not allowed inside Rosecliff & OceanCliff due to potential damage to historic surfaces and furnishings. Thank you in advance for your cooperation. All pre-registered and pre-paid ticket holders will be automatically entered to win fabulous door prizes. For information about any of our Wedding Professionals, click here.